Even in wartime there was still time for dinner, dancing and other special occasions; time for the 1940s woman to get dressed up and go out on the town. 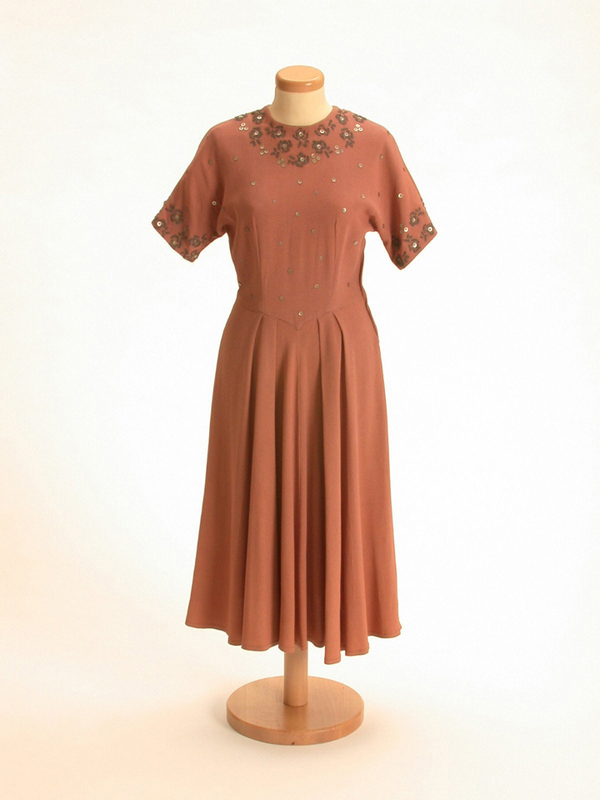 This elegant dress is dusky pink and made from polyester with sequins and embroidered flower details. It was worn in the daytime, or in the evening with a jacket or coat, and a hat. This dress is simple and plain in design, with a round neck, slightly gathered waist and a calf-length skirt. This dress is called a Utility Dress because it was made under the Utility Scheme. This scheme was introduced in 1941 when the British Government rationed clothes. Since there was less fabric available, clothes had to be simpler and plainer in design. The government provided clothes patterns to tailors and factories to make clothes that followed their rules. The rules limited the amount of fabric that could be used, along with a limit on the number of buttons, pleats and pockets. Inside the dress is the label 'CC41' which stands for Civilian Clothing 1941. This shows that the dress was from a government-approved pattern in 1941. The government involved famous fashion designers to make the Utility designs popular. Hardy Amies and Norman Hartnell were among those 1940s designers who created streamlined and stylish dresses with the CC41 Utility Mark. This dress was worth 7 clothing coupons in wartime. (A coat was worth 14, while a pair of socks was 1 coupon.) In 1941, each person had 66 coupons for the year. During World War II, Britain had a shortage of fabric for ordinary, civilian clothes. Factories abroad had to cut down on producing fabric as they concentrated on the war and its needs. The fabric that was brought over in boats often did not make it safely to Britain. Cargo ships were easy targets for enemy attacks and were frequently torpedoed by submarines. So Britain had to rely on its own production of cloth. Scarce cloth was earmarked for making service uniforms, camouflage gear, parachutes and other military items. The government thought that the best solution to the material shortage was to ration clothes, and to make the design of the clothes as trim and economic as possible. The Utility Clothes were simple, practical and did not waste precious fabric. Women's skirts were short and narrow. Blouses were tight and short sleeveless jumpers were common. Jackets were short too, with a maximum of three buttons and a single-breasted collar. Clothes were not supposed to have decorations like embroidery, a row of buttons or an extra pocket. Only buttons, pockets, pleats and stitching that were necessary were allowed. Women's fashions fell in with the rules about Utility Clothes. Styles that were popular before the war became unfashionable. Wide skirts, double-breasted jackets, large cuffs, velvet and fur trimming, and trousers with turn-ups were seen as wasteful and unpatriotic. The new fashion was for an austere silhouette with no adornments. Lines were simple and straight. Military style suits were popular with women throughout the war. They wore boxy jackets, with padded shoulders and narrow waists, and straight skirts that rose to the knee. This dress was suitable for smart day or evening wear. It may have been kept for special occasions. During the war many women worked in factories, in the services or in voluntary organisations, where they did hard physical jobs like making gas masks or patrolling the streets as ARP wardens. Women's work clothes were often either uniforms or overalls, which were hard wearing and long lasting. It is unlikely that this dress would have been worn to work. Instead, the owner would have donned it for dinner, dancing or even to get married. During the war fashions favoured practical clothes that allowed women to move around freely. The wedge shoe, turban, siren suit and kangaroo cloak were some of the most fashionable and practical clothes of the time. The wedge shoe with a cork sole was clumpy but comfortable and women could walk long distances in them. The turban stopped hair from getting in the way of factory work and housework and let women hide their 'bad hair days.' The siren suit was the original jump suit, an all-in-one outfit with a zip up the front. It was convenient for work and warm in draughty situations since it had no gaps. When the air raid siren went off in the middle of the night, it was quick and easy to put on. That is how it got the name 'siren suit' and people often wore this one-piece in the air raid shelter. The kangaroo cloak was another practical favourite because it had roomy pockets to carry essential items. In dashing out to the air raid shelter, the wearer could carry a torch, their identity card and gas mask in the pockets. Places where people took shelter during an air raid, such as underground stations, train stations, basements and Anderson shelters in the garden. 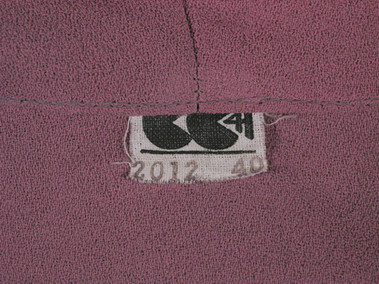 CC41 - Civilian Clothing 1941 - symbol on label of clothes designed by London fashion designers under the Utility Scheme. The designs followed rules about the amount of material and trimming that could be used. 1901-79 - London fashion designer who had his own fashion house and designed clothes for the government's Utility Scheme during WWII. Notably, he became the royal dressmaker in 1938 and designed Queen Elizabeth's Coronation gown. Head-covering consisting of a long piece of cloth wound around the head. The Second World War (1939-45) fought between the Allies (France, the Soviet Union, Britain, Australia, Canada and the USA) and the Axis (Germany, Italy and Japan).